Via Christi is the largest provider of healthcare services in Kansas, with its doctors, hospitals, senior villages, and other medical services. About 7500 participants from more than 90 countries attended the breast cancer symposium. The following are selected brief highlights from these meetings. Clinical trials are a vital component of the continued search for safe and effective treatments. Along with the researchers, the patients and healthy volunteers who participate in testing devices, diagnostic procedures, new drugs, and new uses for established therapies contribute to the advancement of knowledge and patient care. Malnutrition impacts many patients with cancer, yet the clinical consequences of malnutrition are often overlooked. 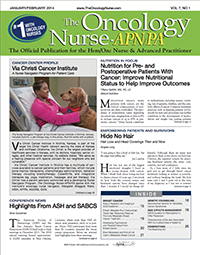 Welcome to the first issue of The Oncology Nurse-APN/PA (TON) for 2014. We’re looking forward to a year of keeping you up-to-date about what is happening in the world of oncology research and bringing you information that helps you in your day-to-day practice as a healthcare professional. Management of ductal carcinoma in situ (DCIS) was the focus of 2 studies highlighted at a premeeting Press Cast for the American Society of Clinical Oncology Breast Cancer Symposium held in San Francisco, California. NEPA, a fixed-dose combination of netupitant and palonosetron, proved more effective than palonosetron alone in preventing chemotherapy-induced nausea and vomiting (CINV) in a large multinational study of 1455 patients, according to data presented at the 2013 San Antonio Breast Cancer Symposium. Data from a large population of patients with multiple myeloma receiving zoledronic acid infusions indicate that osteonecrosis of the jaw (ONJ) remains a significant complication, especially for patients who receive it for prolonged periods, investigators from Greece reported at the 2013 American Society of Hematology annual meeting.